The incident was also captured in print form by the engraver Benjamin Cole of King’s Head Court in Holborn. In The Fair Shoot at a Foul Mark or, A New Way of Wooing, Cole presents the viewer with a birds-eye-view of Lincoln’s Inn Field in which various parts of the incident are played out simultaneously. At the bottom left-hand corner of the image we can see a man bending over and exposing himself at a startled spectator. The head of the servant can also just be seen emerging from a second floor window of a nearby house to discharge a musket at the unfortunate exhibitionist. 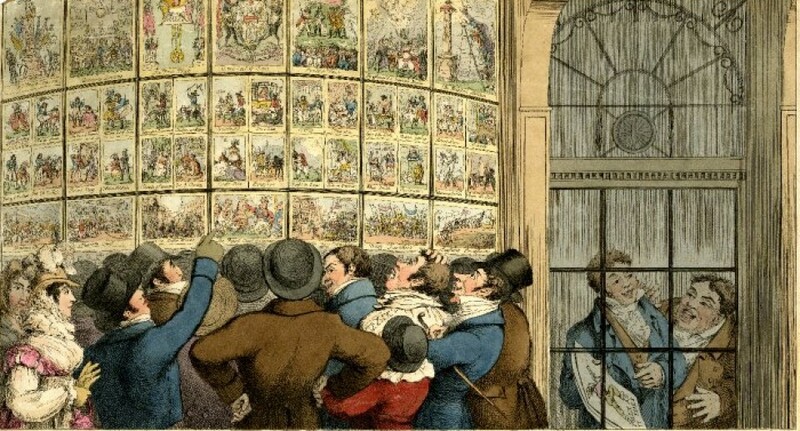 At the bottom right-hand corner of the print the flasher can be seen again, this time kneeling, whilst a companion appears to be attempting to pick buckshot out of his backside. The image is accompanied by a lengthy verse which recasts the story as an epic romantic poem. In this version of events the flasher is a lovelorn young man who believes that women will find his backside more attractive than his face. To present purpose I proceed. But Art to Nature must give plce. Then why shall I my suit give up? I’ll not — but try to make her stoop. The Heat of odd romantick love. Approved, — determines shall be try’d. His Project traps her in his Snare. On first appearance at the Grate. Poor Corydon’s designs are cross’d. Almost as fit to show as name. As ruin’d all his Hopes to come. Nothing so like it, as his Face. 1. It’s a journalistic piece which was created in order to capitalise on public interest in a humorous and unusual piece of tittle-tattle that was evidently circulating around London at the time of publication. 2. Cole was most commonly associated with the production of topographical and architectural prints. In this image it is the landscape in which the incident takes place, rather than the characters themselves, that dominated the printed space. The print may therefore fulfil a secondary commercial function in advertising Cole’s skills as an engraver and his abilities in accurately rendering topography. 3. There are a number of things about this print which suggest that it also contains an element of literary satire. The structure and content of the verse closely mimics the pastoral romantic style of poetry that was popular during the first half of the eighteenth-century. Pastoralists tended to set romantic encounters against highly idealised rural backgrounds which were supposed to reflect the purity and strength of the characters emotions. The archetypal example of pastoralism, which would have been familiar to all well-educated eighteenth century viewers, was Alexander Pope’s The Pastorals (1707), a love story that revolves around two central characters named called Corydon and Phyllis. Cole’s decision to use these names and other stylistic conventions of pastoral poetry suggests that the print is intended to be a deliberate satire on the genre. Here the idealised world of the pastoral is replaced with the dingy reality of a London park in midwinter; a salubrious location which is undoubtedly intended to be a comic reflection of the equally grubby motives of Cole’s arse-waving anti-hero. The date of the publication is also consistent with a wider reaction against pastoralism which began to set into English literary culture during the second quarter of the century. By the 1720s, Jonathan Swift, John Dryden and a number of other poets had begun to launch an outspoken attack on the frivolous fantasy world of pastoral art, claiming that it merely served to distract educated readers from more elevated forms of literature (i.e. there own). Swift even went so far as to publish several mock pastoral poems in which he described mundane every day items in the overblown romantic rhetoric of contemporary pastoralism. Cole’s print can be interpreted in a similar way and offers an interesting example of the blurring of boundaries between the worlds of high art and the low humour of the streets. 4. 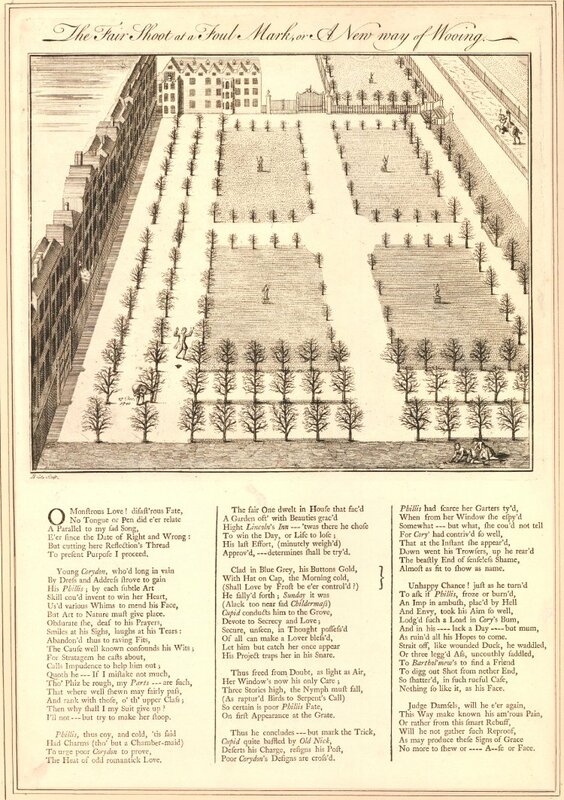 The print also appears to contain a number of subtle references to the fact that Lincoln’s Inn Fields had acquired a reputation as one of Georgian London’s most notorious homosexual cruising grounds by the early 1740s. Cole’s depictions of the flasher on both the left and right-hand sides of the image are both highly suggestive of homosexual activity and crucially Cole has chosen to deviate from the factual account of the incident by depicting the flasher’s victim as another man. The use of the name Corydon would also have been recognised by classically-educated Georgian viewers as a reference to Virgil’s second eclogue, which describes a love affair between two shepherd boys called Corydon and Alexis. The print can therefore also be seen as a knowing reference to a subject which was still culturally taboo and largely excluded from mainstream satirical discourse in the period. Cole’s image may also have inspired a later satire by Henry Bunbury entitled City Fowlers – Mark! (1785), in which an over-enthusiastic hunter is about to discharge his shotgun into the exposed backside of an unsuspecting bystander who had stopped to relieve himself behind a nearby shrub. A conference organised by the University of Brighton in association with the Royal Pavilion and Brighton Museum. Taking place in Brighton on 23rd September 2016. After Henry William Bunbury, c.1780. 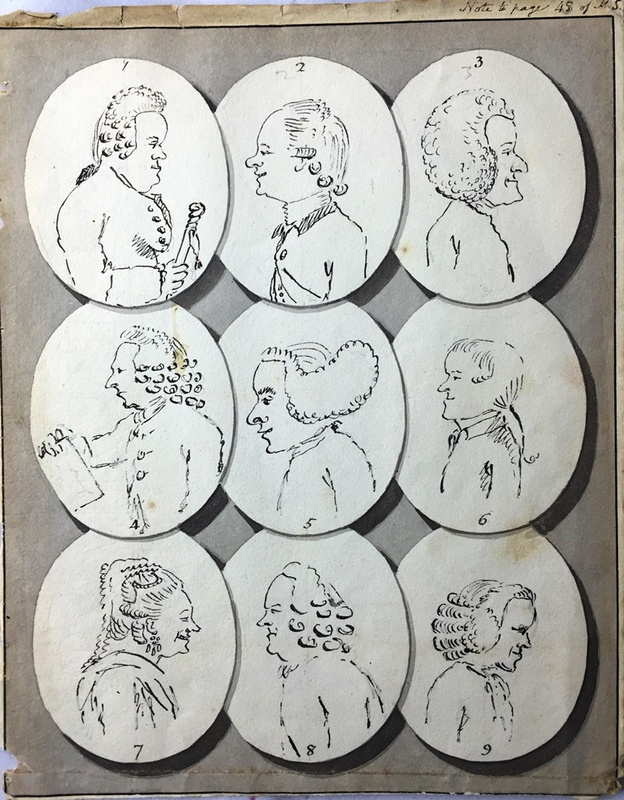 This set of nine small caricature studies came up for auction in the UK earlier this week. The auctioneer attributed them to Henry William Bunbury but I suspect that they are more likely to be the work of an amateur caricaturist who was active around the same time. The subjects clothing suggests that the artist must have moved in wealthy, or possibly even courtly circles, and was no doubt one of the legion of enthusiastic amateur artists who supplied designs to the proprietors of London’s printshops during the 1770s and 1780s. The cards themselves are neither signed nor dated and have estimated their likely date based on the dress of the subjects. If you look at the image above in detail you will note that the cards have slightly irregular edges, indicating that they originally square pieces of card that were trimmed down into an oval shape. This may have been done after the drawings were completed, in an attempt to emulate the conventionally oval shape of conventional miniatures and silhouette portrait studies. Alternatively, the cards could have been cut before they were drawn on, in order to make them easier to carry and to hold in one’s palm while executing a rapid off the cuff sketch. We know that Gillray was in the habit of carrying a deck of small blank cards around with him in order to quickly capture likeness and it’s perfectly possible that other artists worked in a similar fashion. Now this is as nice a piece of satirical transferware as you’re ever likely to see. 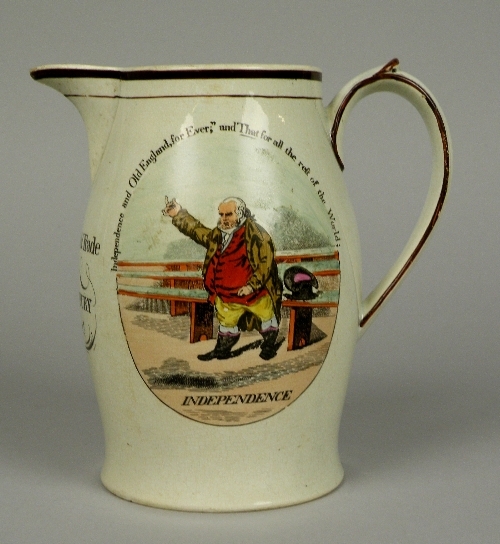 It’s a creamware baluster jug carrying a copy of James Gillray’s Independence (1799). 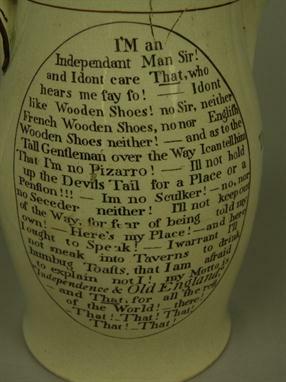 Sometimes the engravers and colourists who worked in the potteries were not particularly careful about the way in which they interpreted designs; images were frequently altered to accommodate the restricted surface of a pottery vessel or to highlight only the most important features of the image. The engravers working in provincial potteries were also often less capable craftsmen than their counterparts in the publishing trade and were not always as concerned with accuracy and attention to detail. This design however, has been copied with a surprising degree of care and skill. The potter has even copied minute details of colouring, such as the pink hatband inside the upturned top hat behind the protagonist. This indicates that the pottery was almost certainly working from an original copy of Gillray’s print which has either been ordered from Humphrey’s shop, or purchased by an agent of the company who was based in London. By 1799 Tyrwhitt Jones had become the sort of politician that the English love the most (or indeed, the only sort of politician they like at all): an eccentric. 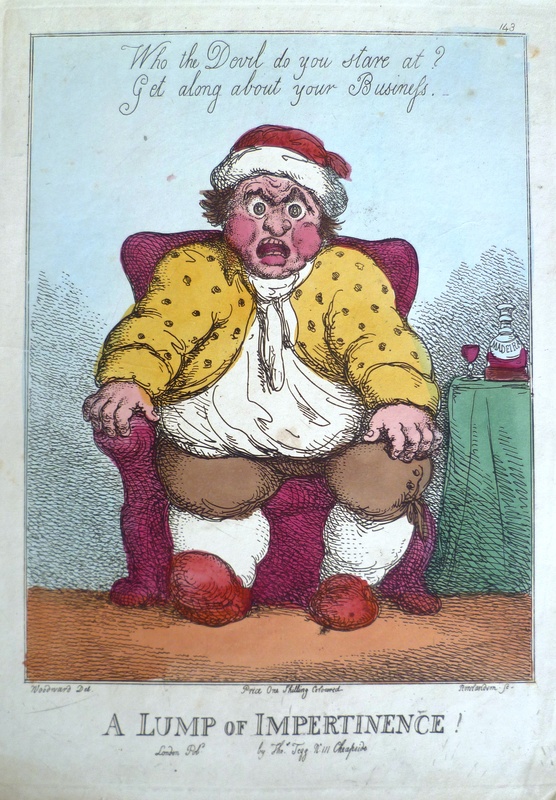 Gillray evidently thought him a worthy subject for caricature and the fact that his design was circulated on pottery indicates a much wider audience for the subject matter.